It’s time to get Lucky In Love just in time for Valentine’s Day! 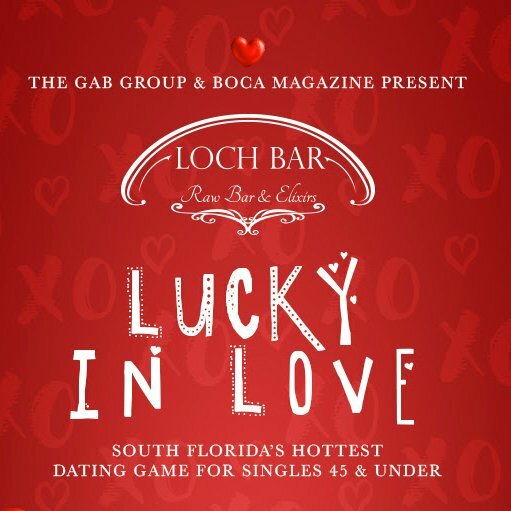 Meet us at Loch Bar in Mizner Park this Tuesday, February 12, for South Florida’s best bet at finding your perfect match while you enjoy a lively Dating Game, shared bites and seductive cocktails. Presented by The Gab Group and Boca Magazine, doors to this can’t-miss event open at 6PM. Your $10 admission includes a complimentary cocktail plus a lock or a key that possesses a single match – spend the evening mixing and mingling to find your other half, then watch as even more romance unfolds during a high-energy and entertaining Dating Game at 7PM! David Rosenberg, Rosenberg Diamonds & Co.
By the end of the night, sparks will fly and five new couples will be Lucky In Love – all while you celebrate discovering your own new romance!